The E-Pace rides on a modified version of Jaguar Land Rover's platform that underpins the Range Rover Evoque. It is about a foot shorter than the Jaguar F-Pace and about an inch and half longer than the Evoque. Suspension: Front, McPherson strut with lower control arms, coil springs and passive shock absorbers and passive anti-roll bar; rear, integral multi-link with coil springs, passive dampers and passive anti-roll bar. LONDON -- Jaguar’s E-Pace, the luxury automaker’s performance-oriented compact crossover, is coming to Canada in early 2018 and will slot in one of the market's hottest segments. It has a starting price under $45,000, destination included, and is loaded with connectivity and safety features, such as head-up display and a semiautonomous off-road driving system that allows the driver to take his or her feet off the pedals while the vehicle drives over slippery terrain. The E-Pace is also fast, with one model reaching 60 mph in under six seconds. The E-Pace will be built in Austria by Magna Steyr, the vehicle-assembly arm of Canadian parts giant Magna International, under contract and at a plant in China that will supply the Chinese market. Jaguar says Chinese-made vehicles won't be shipped to North America. The vehicle will start at $44,300 and top out at $60,600 for the E-Pace First Edition, destination fees included. Finbar McFall, Jaguar Land Rover's global product marketing director, told reporters at the E-Pace debut here Thursday that the company expects 80 per cent of customers to be new to the Jaguar brand. He said the E-Pace may be a family's only vehicle and that it has been designed to cater to those who value connectivity. "There is a USB port for every passenger," he said. There are also four electrical sockets in the interior and the E-Pace comes standard with a Wi-Fi hotspot. The five-passenger E-Pace is powered by Jaguar Land Rover's Ingenium 2.0-litre gasoline engine available in 246- and 296-hp variants. Both are mated to a nine-speed ZF automatic transmission, and all-wheel drive is standard on all models. Diesel engines will be offered in other markets; none are planned for North America. Jaguar's global sales in its most recent fiscal year increased 83 per cent to more than 172,000 worldwide. Those gains were mostly on the strength of the brand's first crossover, the F-Pace. McFall said the F-Pace is the fastest-selling Jaguar in the brand's history with more than 80,000 sold globally since April of last year. 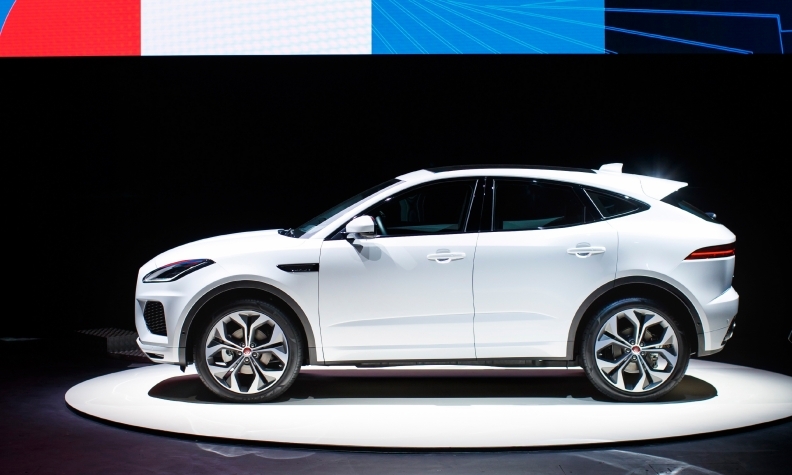 IHS Markit expects E-Pace sales to peak globally at around 61,500 during 2019, at which point Jaguar's overall deliveries worldwide will stand at 270,800 cars and light trucks -- a remarkable comeback from the lows of under 50,000 vehicles in 2011 and 147,300 units last year. 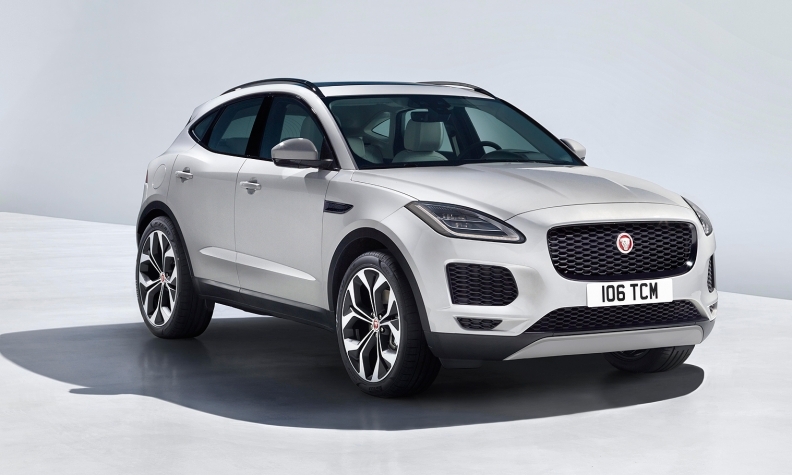 Ian Callum, Jaguar's director of design, said the E-Pace is not a smaller-scale version of the F-Pace. E-Pace rides on a modified version of the platform that underpins the Range Rover Evoque. It is about a foot shorter than the F-Pace and about an inch and half longer than the Evoque. Some of the E-Pace's design cues, such as the headlights and fascia, were taken from the F-Type sports car. But the E-Pace also introduces some new design cues for the brand, Callum said. Those include stylized taillights with chicane design that wrap around the rear quarter panel in a narrow band of light. "The taillights will be a Jaguar signature," he said. Jaguar officials made a point of referencing the F-Type's handling and performance as the inspiration for the E-Pace. A compact rear suspension design enables more interior room, and Callum says that the vehicle can transport five adults comfortably. Although Jaguar showed the battery-powered I-Pace first, the E-Pace arrives in dealers ahead of the brand's first electric vehicle. The Porsche Macan will likely be the E-Pace's biggest competitor, Jaguar officials say.